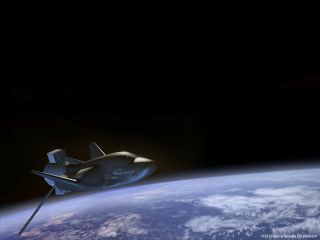 Sierra Nevada's Dream Chaser space plane, seen in this artist’s illustration, is one of three vehicles that NASA has chosen to fly cargo to the International Space Station from 2019 through 2024. NASA has selected SpaceX, Orbital ATK and Sierra Nevada Corp. to fly cargo to the International Space Station (ISS) starting in 2019, the agency announced today (Jan 14). Between 2019 and 2024, NASA will purchase a minimum of six uncrewed cargo missions from each of the three companies, agency officials said in a media briefing today. The space agency has the option to purchase additional re-supply missions from any of the three providers, and will likely do so, said Kirk Shireman, program manager for the ISS. The new round of contracts is referred to as CRS2. Dragon and Cygnus will keep flying in the CRS2 missions, but Sierra Nevada's Dream Chaser will join them. This space plane is capable of landing on a runway, as NASA's now-retired space shuttles did; this ability will provide some unique science opportunities, NASA officials said. Shireman said the details of why these three candidates were selected will be released soon. At least two other companies, Boeing and Lockheed Martin, had submitted proposals for the CRS2 contract as well. NASA officials did not say how much each mission would cost, but Shireman said the maximum total value of all the CRS2 contracts is $14 billion. This number, however, was set as part of a government requirement, Shireman said, adding that the actual cost of "the mix of flights that we're looking at will be nowhere near that value." Dragon and Dream Chaser both return to Earth after each mission is done. However, Dragon experiences "hard landings," which usually mean parachuting straight down into the ocean, whereas Dream Chaser will land more gently on a runway. Runway landings tend to have a lower physical impact on the return cargo, and they allow for something called "accelerated pressurized return," which means the cargo can be retrieved within 3 to 6 hours after landing, said Julie Robinson, chief scientist for the ISS. This is beneficial for experiments that include live animals or other living samples, Robinson added. When scientists want to test the effects of gravity on biological samples, for example, it is often crucial to examine the samples as soon as they return to Earth, before they start to readapt to gravity, Robinson said. In addition, gentle landings can be better for preserving delicate samples, such as crystals grown in microgravity. Both Orbital ATK and SpaceX suffered launch failures during NASA CRS1 missions in the last 15 months, resulting in the loss of NASA cargo intended for the orbiting outpost. Orbital's Antares rocket exploded shortly after pushing off the launch pad in October 2014, and SpaceX's Falcon 9 rocket disintegrated just over 2 minutes after liftoff in June 2015. Those setbacks did not pose a threat to the lives of the crewmembers aboard the station. But NASA officials said that having a third cargo supplier available was a factor in its CRS2 decision. "One of the considerations from an operational standpoint on the ISS, it's really important to have more than one supply chain," Shireman said. "If you lose one, you have the ability for another one being [implemented] right after it from a similar redundancy or a similar supplier." SpaceX, along with Boeing, has also been selected by NASA to supply crew transportation to the orbiting outpost, with the first astronaut-taxi flights beginning as early as 2017.